It might seem strange to think that your one-month-old is actually learning or absorbing something of the reading time, but he does! Depending on your baby’s age, you can focus on different aspects of the reading experience, to make sure that he gets the most out of it! 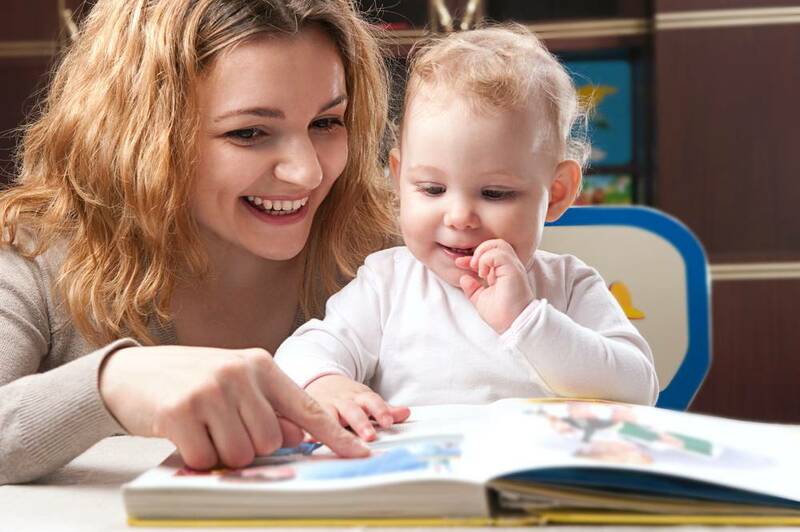 Your baby can: At this stage, your baby can look at the book you are holding, listen to the sounds you make and begin to copy them, and watch your facial expressions and begin to imitate them too. Observe your baby, is he smiling, cooing, or moving his hands? This means he loves reading time. Just remember that your baby can only pay attention for one or two minutes at a time. You can: Find a quiet place to cuddle up and read together. While reading, point at the pictures your baby is looking at and mention their names. It’s also great to act them out using facial expressions, different tones of voice, and hand gestures. In a serve-and-return manner, imitate the sounds your baby makes as if you were having a conversation. Your baby can: Your child can reach toward the book and pat the pictures in it, paying attention for only a few minutes at a time. Your baby probably copies some of the sounds and facial expressions you make while reading. Also, at this age, try to identify if he has a favorite book. See if he gets more exited about reading one specific book by smiling, squealing, or reaching towards it! You can: Find a quiet place to cuddle up and read together. While reading, point at the pictures your baby is looking at and mention their names. It’s also great to act them out using facial expressions, different tones of voice, and hand gestures. Imitate the sounds your baby makes as if you were having a back-and-forth conversation. Your baby can: He can hold onto a book and explore it by feeling it, turning it, putting it to his mouth, and patting the pictures in it. At this age, your baby can also copy some of the sounds you make, as well as your facial expressions and gestures. Is your baby smiling or babbling? This means he loves reading time. Just remember that he can only pay attention for a few minutes at a time. You can: Find a quiet place to cuddle up and read together. While reading, name and point at the pictures your baby is looking at. Also, at this age, you can start helping your baby to turn the pages, trailing his interest. It’s also great to act out the stories using facial expressions, different tones of voice, and hand gestures. Imitate your baby’s sounds and talk to him about the pictures in the book. Your baby can: At this age, your baby can now reach for his favorite book out of the two you offer. He can also hold onto a book and explore it by feeling it, turning it, opening and closing it, and patting the pictures in it. At this age, your baby will copy some of the sounds you say, as well as your facial expressions and gestures. You can: Find a quiet place to cuddle up and read together. While reading, name and point at the pictures your baby is looking at, is touching, or talking to. Respond to what catches his attention by talking about it! Help him turn the pages, following his interest. It’s also great to act out the stories using facial expressions, different tones of voice, and hand gestures. Imitate your baby’s sounds and also talk to him about the pictures in the book, especially the ones he is interested in. Get more information about the benefits of reading and learn about a few resources you can use to help you along the way with the Books Build Connections Toolkit from the American Academy of Pediatrics. Kids who are read to everyday have stronger language skills when they reach kindergarten, and are therefore more prepared to learn to read.